Big changes happening this week! There are four planets changing signs, something that always stirs up the atmosphere plus a tense New Moon in Taurus. Tuesday is a very big day featuring the New Moon in Taurus, followed shortly by Uranus transitioning into Taurus and Mars leaving Capricorn for Aquarius. On the weekend, Venus slips into watery Cancer and the Sun moves into Gemini. Then there are a few aspects to contend with. Yup . . . we’ve reached a major turning point. The first event this week is the New Moon in Taurus Tuesday morning. While there is a generous dose of Taurus inspired amiability coloring this New Moon, it is the Cappy Mars square to Uranus in Aries that creates plenty of tension. The really BIG event occurs a few hours after the New Moon when Uranus finally leaves fiery Aries for earthy Taurus, effectively turning out the fire pilot light that’s been steadily burning since Uranus entered Aries in May 2010. Something to keep in mind is Uranus was quite comfortable in independent Aries, much more so than it will be in cautious Taurus. Uranus in cardinal Aries was ready to move at a moment’s notice and we often felt the transits ahead of the exact degree. This is unlikely to be the case with Uranus in fixed Taurus who prefers a slow, steady pace. Our changes may happen very fast and with less forewarning. Uranus is always rebellious and in Aries it was all about ‘me’. 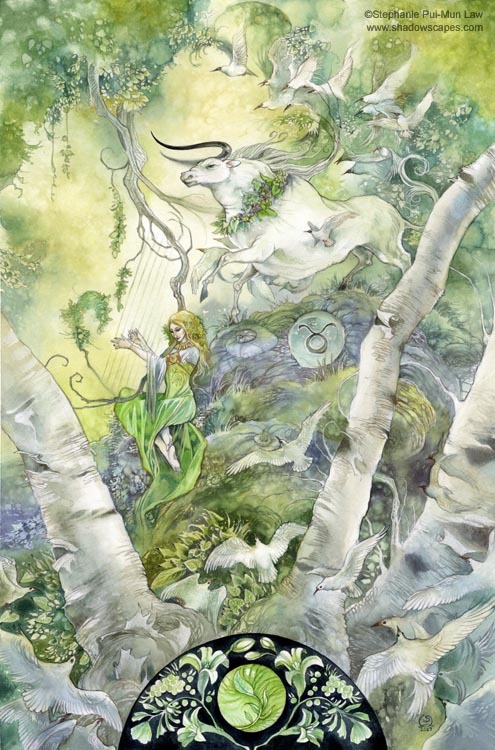 In Taurus it could be more about needing to make changes in regards to food, shelter and security. In any case we have time to see how this will play out in our own lives and on the world stage. Mars moving into fixed Aquarius from pragmatic, cardinal Capricorn and promptly squaring Uranus in Taurus is going to have unexpected results. What may have the greatest impact is the move from aggressive cardinal energy to stabilizing fixed. We may find ourselves in a stalemate rather than the big push forward we were anticipating. Having alternative ideas already in the works can relieve some stress. Mars in Aquarius is usually quite good at coming up with unusual workarounds. Now Venus gliding into sensitive Cancer on Saturday and immediately moving into a relaxing sextile to Uranus in Taurus is good news. Venus was not happy in Gemini where she didn’t receive much in the way of friendly aspects. In Cancer she’ll get plenty of love and happily spread it around. However she will struggle some on Sunday when Venus is inconjunct abrupt, detached Mars in Aquarius. A little kindness and consideration will ease tense situations with loved ones. The Sun leaving earthy Taurus for airy Gemini on Sunday is also good news. This ought to lighten the atmosphere and encourage the exchange of ideas again. Two full time planets in air improve objectivity and encourage us to see more options. A really useful aspect happens on Friday when Mercury in Taurus is trine Saturn in Capricorn. This one is perfect for helping us come to terms with all the changes happening this week. Common sense solutions are more obvious now. This week’s lunar journey begins with the Taurus Moon deep in the dark of the Moon prior to Tuesday’s New Moon. Monday finds the Taurus Moon well supported by Neptune in Pisces, Jupiter in Scorpio and Pluto in Capricorn. The overall energy levels will probably be low, so sticking with simple, routine tasks will be best. Tuesday has a VERY busy sky with the New Moon in Taurus, Uranus entering Taurus and Mars making his move into Aquarius last Tuesday night. The Taurus Moon will go void-of-course following a strengthening trine to Mars in Capricorn during the afternoon. About fifteen minutes later, the Moon arrives in spritely Gemini, just in time to help give us a touch of emotional detachment . . . something we can use to handle the fast moving changes occurring. The Gemini Moon gently dances along unencumbered by aspects until late Wednesday afternoon, when she’ll square mysterious Neptune in Pisces. Take care of important business as early in the day as possible because once the edges start blurring, it will be easy to miss a critical bit of data. Easing the atmosphere Thursday morning is a Gemini Moon-Venus conjunction, adding charm and wit to our conversations. The Moon will be void-of-course from midday to late afternoon when she glides into her home sign of Cancer. We get our first taste of a harmonious lunar aspect to Uranus in Taurus when the Cancer Moon is sextile to Uranus during the late afternoon. Friday is one of the more sane days this week featuring the Mercury-Saturn trine as well as a Grand Trine in water with the Cancer Moon, Jupiter in Scorpio and Neptune in Pisces. We’ll need to listen to our intuitive responses to those we interact with in order to make the most of this advantageous energy. Over the weekend we may want to plan family time during the day on Saturday while the Moon is still in Cancer. Following a lovely sextile to the Taurus Sun during the afternoon, the Moon will be void-of-course until late afternoon/early evening when she strolls into fiery Leo. That’s when it could get interesting because the first aspect the Leo Moon makes is a square to Uranus in Taurus. Yes, on to the next experience with the new Uranus. Saturday evening plans could be subject to change without notice. The Leo Moon doesn’t have an easy time on Sunday either with a square to Mercury in Taurus midday and one to Jupiter in Scorpio in the evening. Neither Taurus nor Scorpio is all that fond of Leo’s boisterous, extravagant ways, so don’t be surprised if there is marked resistance to the Leo Moon’s ideas of enjoyment. Besides, many of us will probably being feeling the need to rest up before the coming work week. There is a lot to take in this week and it will be important to give ourselves time to adjust. This may be especially true for those of us whose natal charts are dominated by fixed signs or have a fixed sign Sun, Moon or Ascendant (Taurus, Leo, Scorpio and Aquarius). Treat yourself and others with kindness, tolerance and loads of patience. See you on the other side!